Shopsmith's retractable casters make moving your Mark 7 or Mark V around the shop an effortless snap ! These rugged retractable casters have been made especially for the Shopsmith Mark 7 and Mark V, almost since day one. Hundreds of thousands of sets have been in use for nearly 50 years... and failures of any kind are practically unheard-of. Step twice on the actuator and the ground clearance increases to 1/2"
A third step allows your Mark 7/Mark V to settle gently back onto the ground when you're ready to go to work. Each set features 2" diameter rubber wheels that swivel a full 360° for effortless directional changes and all the nuts and bolts you need for fast, simple attachment to the pre-drilled holes in your Mark 7/Mark V's legs... in about a half an hour ! Once you've had a set of these babies, you'll wonder how you've done without them ! As a sidebar, many customers have even adapted these casters to workbenches, shop cabinets, stationary tools and other uses around the shop. Wish you could... Roll your Shopsmith effortlessly from location to location with one finger? Check out Shopsmith's Premium Retractable Casters. 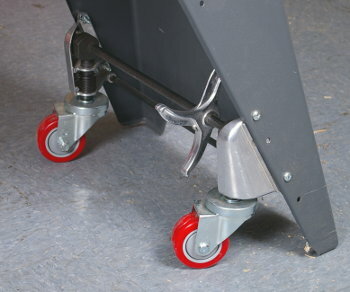 Upgrade your retractable casters with these easy-rolling 3" polyolefin casters. Need a Standard Replacement Caster? 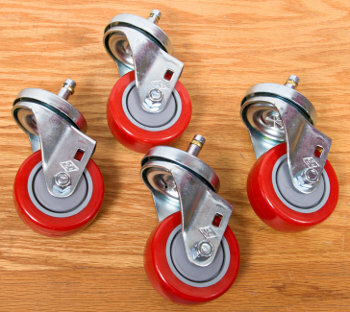 Click here for standard replacement casters.